DOROTHY LINELL gave her London recital debut at the South Bank Centre’s Purcell Room as a winner of a national Young Artists’ Competition. Since then, she has played instruments ranging from baroque guitar to banjo in venues from Moscow to Mexico. Performances for international festivals, major concert halls and the opera theatre include work with James Bowman, Charles Brett, Jean-Pierre Rampal, Steven Rickards, Deller Consort, English National Opera, Glyndebourne Opera, Kathleen Battle, Arleen Auger, and Simon Rattle with the renowned City of Birmingham Symphony Orchestra. She has appeared alongside Dame Cleo Laine and Sir John Dankworth at their Wavendon Festivals, with violinist Peter Fisher’s Chamber Ensemble of London, and was also privileged to perform with Peter at Sir John’s memorial concert. 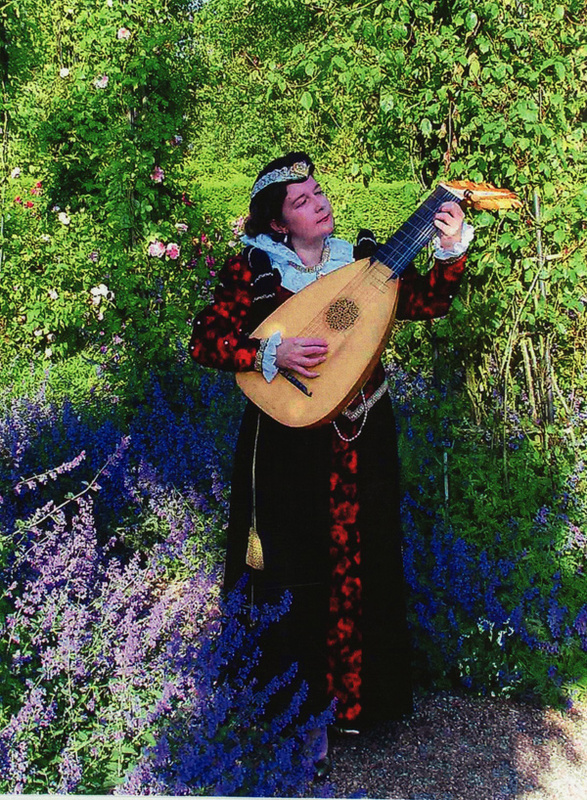 She played for Nigel Kennedy and the English Chamber Orchestra in Vivaldi’s “Four Seasons” for TV and video and on several subsequent tours, including concerts for members of the Royal Family at St. James’s Palace. She has performed in Words and Music programmes with Dame Judi Dench, and in Westminster Abbey for a Bush Theatre production marking the 400th anniversary of the King James Bible. Television work includes portraying the lute-playing Mary Queen of Scots for a BBC TV documentary, incidental music for Channel 4’s two series on Queen Elizabeth 1st and King Henry 8th, and even playing in a sewer for ITV’s “Candid Camera” spin-off show “Game For A Laugh”! With American countertenor Steven Rickards, she recorded two CDs for Naxos, of lute songs by John Dowland and Thomas Campion, and performed these songs in Costa Rica and Honduras. She has also recorded alongside Sir Ian McKellen for Naxos Audiobooks. Dorothy has broadcast with James Bowman and the Chapel Royal Choir on Aled Jones’ BBC Radio 3 “The Choir” and Radio 4’s “Morning Service” as a “Musician Extra-Ordinary” – following in a tradition dating back to the fifteenth century of musicians employed on an occasional basis to perform with the monarch’s own musicians. She has joined the Chapel Royal for the annual Ballroom Carol Concerts in Buckingham Palace, broadcast by Classic FM on Christmas Day, and also at Kensington Palace. Concert tours have taken her across Europe, to Scandinavia (including a broadcast at Hamlet’s Kronborg Castle), Israel, Lebanon and Ny Alesund, the world’s northernmost inhabited town. Dorothy performed on several transatlantic crossings aboard the legendary Cunard flagship QE2, and other work on cruise ships (for Fred. Olsen) includes The Caribbean, Spitsbergen and Arctic Circle, North Cape, Adriatic, Baltic States, Iceland, The Canaries and Cape Verde Islands. Can She Excuse My Wrongs. From Songs and Sorrowful Sonnets, with James Bowman. Remember O Thou Man. From Songs and Sorrowful Sonnets, with James Bowman. Melancholy Galliard. Lute solo from Songs and Sorrowful Sonnets.